telling session at a Sakshi Library. Sakshi builds and equips libraries at schools in slums.Children are provided with books, games and craft material. A trained Sakshi librarian holds session in story-telling, arts and crafts and role play helping each child learn and bloom. The libraries also tracks the progress of Sakshi Non-Formal Education Centre graduates, former drop-outs who have been mainstreamed back into MCD schools, ensuring they do not drop out again. The Sakshi Library Program provides resources for students to go beyond classwork and expand their minds and abilities. It also provides help to students struggling with coursework. 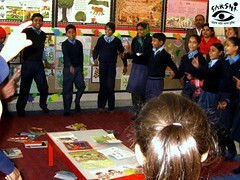 Lessons are taught, as at every Sakshi Education Centre, through interactive activities like games, role play, songs etc. Pupils imbibe better when they engage actively with the material. They also realize learning is fun and develop a lifelong instinct for it. We call this method of teaching "Joyful Learning". improve the reading and writing skills of the pupils. promote the habit of reading. put some fun into learning especially for children struggling with lessons. the librarian also tracks graduates from Sakshi's Non-Formal Education Centres (NFE's) who have been mainstreamed back into MCD schools, working with Sakshi's Remedial Centres (RC's) to assess their progress and provide support. A pupil at a covered school spends 6 hours per week at the Library. There is something about the variety of resources a Library provides that lets students truly blossom and express their individual personalities. It is a joy to behold. Donate to Sakshi. If you wish, you can specify your contribution go towards Education or specifically, the Library Program. Sponsor the building of a new school library which can be dedicated in your name or anyone else you wish to gift the dedication to. Please contact us at connect@sakshingo.org for a project proposal.